Students will be able to explain how the rotation and uneven heating of the earth cause patterns of oceanic and atmospheric circulation. Students evaluate the effectiveness of a model to represent global ocean and wind currents. Students combine information they gain from videos, demonstrations, and articles in order to find evidence to support their claim. CCSS.ELA-LITERACY.WHST.6-8.9 Draw evidence from informational texts to support analysis, reflection, and research. I begin every class by asking the students "What are you going to learn today?" Students respond by referring to the Essential Question, "How can I demonstrate science and engineering literacy?". This EQ is included on their Unit Plan and on the front board. This may seem like a simple way to start a class, but there is a lot of power in it. Watch this video to learn more. As the previous lessons in the unit have been designed to help students work towards mastery on the skills in the Unit Plan, I ask students to reevaluate their self assessments from the previous day. Students rank themselves on each of the skills included in the Unit Plan. Students rank themselves on a scale of 1 to 4 (4 being mastery). Students will continue to update these scores over the course of the unit. I emphasize to them that it is ok not to be at a "4". Learning is about growth! We will use this starting point to track the growth in their learning. This video not only includes insight into how to implement this in your classroom, but also provides reasoning for why it is such a powerful tool for student growth! Explain that over the next few days, the students are going to have to evaluate the effectiveness of a model to represent global ocean currents and global wind patterns. Students will look at the aspects of the model that accurately represent oceanic and atmospheric circulation in the real world and those aspects that are either missing or misrepresented. In order to do this, students will have to do research. They will watch videos, read articles, and perform lab stations to build and develop their understanding of global ocean currents and global winds. Then, students have to make a claim about whether the model is effective or ineffective and support that claim with evidence from multiple sources. This seems overwhelming! However, I explain to the students that we are going to model this process and that with all of the work we have done in the school year, I know they have to tools to complete this task. I begin by showing the class a demonstration that could serve as a model of global ocean currents. I place warm water in a plastic tote. In a separate cup, I place red food coloring in hot water. In one end of the tote, I pour the hot, red water, and in the other side of the tote I place several blue ice cubes (I simply add food coloring to an ice cube tray the night before). To watch me introduce this to my students, check out this video! 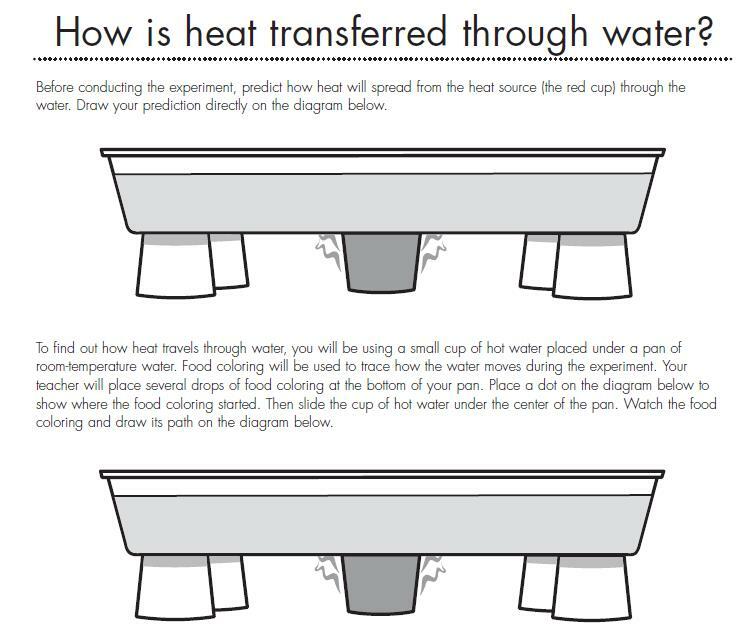 In this model, the blue water moves along the bottom of the tote towards the hot, red side while the hot, red water moves along the top towards the cold blue side. Then, a convection cycle begins as the blue begins to rise and the red begins to sink. (For more about how to complete this model, check out this video.) Ask students to share any observations they are making about the model and the causes of what is occurring. Explain that this could be used as a model to represent global ocean currents and that we are going to evaluate the effectiveness of this as a model. 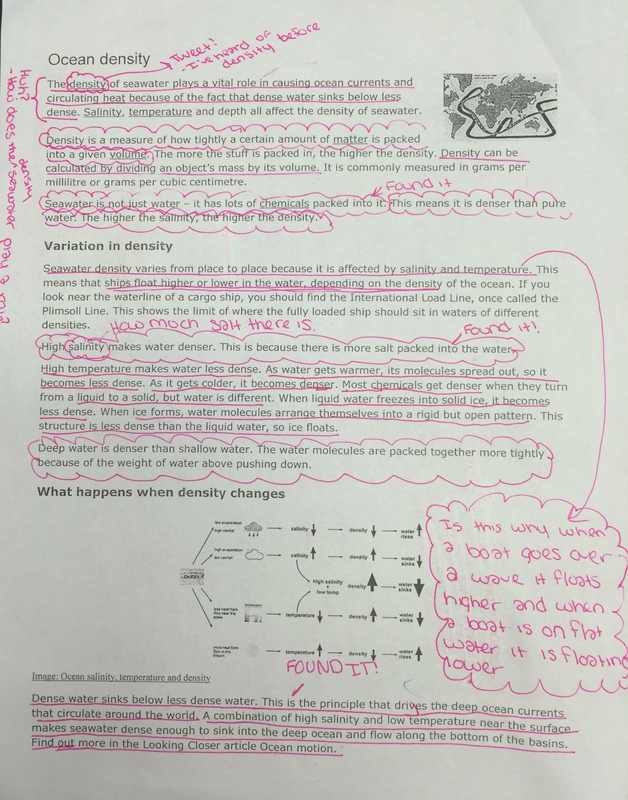 Provide students with the "Oceans density" article. Students in my class have used this strategy throughout the entire school year. In this lesson, I take the opportunity to review and revisit the meaning and application of the strategy. 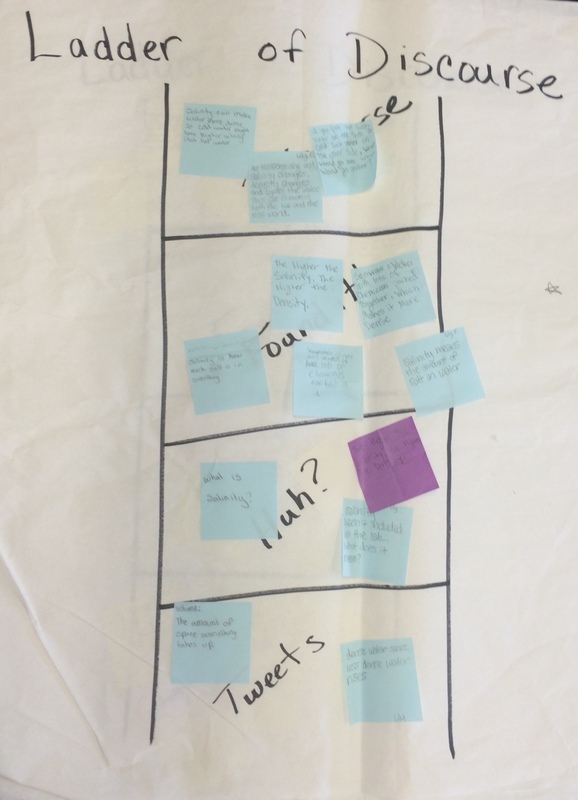 Before I have students read the article, I ask the class what each rung of the ladder means. Especially in this situation, I reinforce that they are reading for the purpose of evaluating the model we just witnessed. So, their "Found it! 's" are going to be similarities and differences they find between the text and the model itself. Then, I provide them with time to read the article and talk to the text. I wanted to include the example above to show some things to do and not to do when climbing the ladder of discourse. First, you are going to notice that the student above spent a large amount of time underlining and circling almost everything on the paper. Watch out for this! Students can confuse highlighting and underlining as "talking to the text" when it is not. You will notice that this student included Tweets such as "I have heard of density before" and Huhs such as "How does the density of sea water play a role?". You will also notice that the student found the answer to this question later in the article and wrote "Found it!". However, this student is missing Found It! 's that show that she is identifying similarities and differences between the text and the model. This is a hard skill, and students need feedback in order to determine how to do this. In terms of Discourse, this student makes an interesting connection to the idea that a boat might float higher in an ocean than the same boat would float in freshwater. When students are finished reading, I provide each table group with posters that have a Ladder of Discourse drawn on them. I ask that each student adds sticky notes to the appropriate rung of the ladder based on the notes they made as they talked to the text. Students share their ideas as they add their sticky notes. Then, I ask students to create a Venn diagram that will help us organize our ideas as we research global ocean currents. I have them label one side of the Venn "Global Ocean Currents" and the other side "The Model". Next, I have each table focus on the "Found it!" rung. From the ideas generated here, I have the students add similarities and differences to their Venn. Then, I play a short clip from an Ocean Circulation video by Study.com. I only play from 1:22 to 1:54. I explain that as I play the clip, they should add to their Venn any new information they pick up. Again, their purpose is to watch the video and look for similarities and differences between the model and actual global ocean currents. After I play the video the first time, most students do not write anything down. I explain that happens to me as well. Often when trying to view a video for information, I have to watch the video a second time to find what I need. Then, I say, "I am going to play it again. As you watch this time, add any new information you gain about global ocean currents that you can add to the Venn." *Keep in mind that the example above is a completed student Venn. Later in this lesson, students watch more videos and read more articles to add evidence to their Venn. At this section of the lesson, your students will not have that many examples. However, I thought it was important to show you here where your students are headed. Using videos, visual demonstrations, and articles to support a claim provide the students with a deep understanding of the model. In this video, I describe the importance of using multiple media for evidence. Evaluating Models - Huge Up Side! After students have finished adding to their Venn diagrams, I call a group of students to a table to model the evaluation protocol they will follow later in the lesson. In my classroom, we call this a "Fishbowl". A group of students models a protocol while the remaining students stand around the group and observe the successes and needs of improvement of the group. 1. 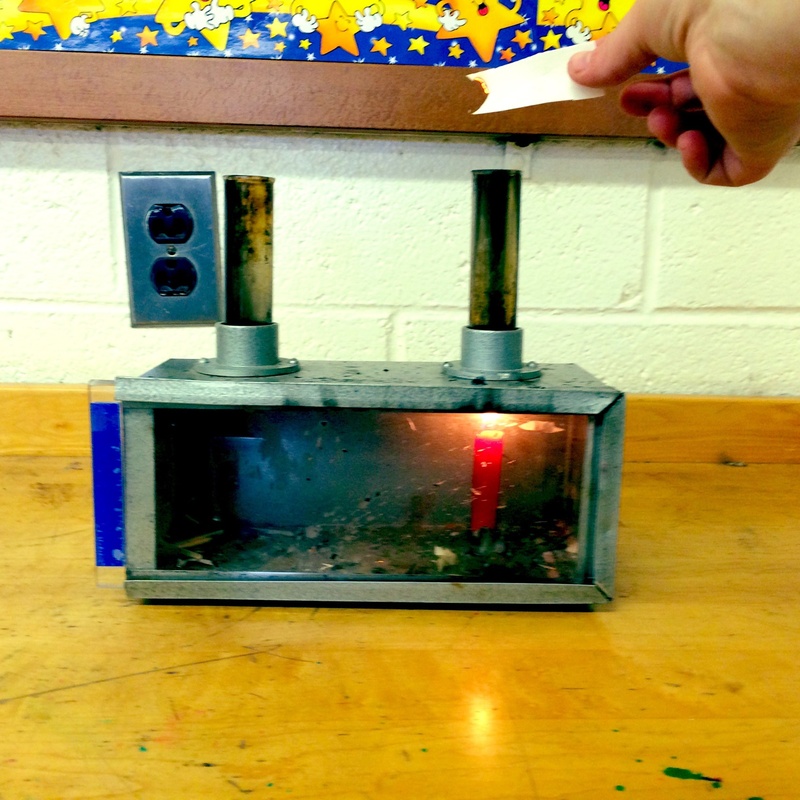 Provide 20 seconds of wait time for students in the group to “evaluate the effectiveness of the water convection box as a model of how the unequal heating and rotation of the Earth cause patterns of oceanic circulation.” At the end of the 20 seconds, each student will hold up a “thumbs up”, “thumbs down”, or a “thumbs neutral” as a representation of their evaluation. 2. One student with a “thumbs up” or “thumbs neutral” shares one piece of evidence that supports the idea that the convection box is an effective model. 4. Students add to their Venn Diagram any new evidence that arose during discussion that will help with their claim. 5. Repeat steps 2 – 4 until all students with a “thumbs up” or “thumbs neutral” have shared their evidence supporting the effectiveness of the model. 6. Repeat steps 2 – 5 for all students with a “thumbs down” or “thumbs neutral” to share evidence against the effectiveness of the model. 7. Once all evidence has been presented, provide 20 seconds of wait time and have the group consider the original question again (“Evaluate the effectiveness of the water convection box as a model of how the unequal heating and rotation of the Earth cause patterns of oceanic circulation.”) At the end of the 20 seconds, each student will again hold up a “thumbs up”, “thumbs down”, or a “thumbs neutral” as a representation of their evaluation after hearing all of the evidence shared by the group. Want to watch this protocol in action? Watch this video that includes not only my reasons for using this strategy, but also includes classroom footage! After watching the protocol unfold, the students outside the fishbowl should reflect on the key aspects of the protocol, the things that worked well for the group, and the things that needed improvement. I explain that once students have completed all research about global oceans, that they will be following this protocol as a way to share information and make a claim. To close, I remind students that they will be writing an ABCDE paragraph in order to defend their claim about the effectiveness of the model. I ask students to describe what each letter of the acronym means and share an example of what a student might write in their final evaluation writing piece. The ABCDE Paragraph is something that my students have used many times throughout the year, so this closure is review. If this is your first ABCDE paragraph, it will take time to teach. The resources includes a Quick Guide to the ABCDE Paragraph. ***This paragraph will be a variation of the ABCDE paragraph. As students will cite multiple sources, this paragraph will end up being an ABCDCDCDE paragraph. Remind students that in yesterday's lesson they began evaluating a model's effectiveness for representing global ocean currents. Explain that they will continue this work for the next two days. Help students get to the Global Ocean Current and Global Wind Pattern Website. Show students how to navigate the pages on the site. There are two pages - one dedicated to global ocean currents and one dedicated to global wind patterns. Each of these pages provides the directions to research and complete the station. For each, students will read articles, watch videos, and perform a lab station. **You will notice that the website references an "ABCDE" paragraph. Details and explanation about this format of writing is included in both the "Closure" of this lesson and in the "A Look at Student Work" section. Both the Global Ocean Currents and Global Winds Pages ask students to complete a lab station that will serve as the model they are evaluating. More information about these are included below. Students must wear goggles while performing this task. If any item is on fire and a student is concerned, students should place that object in the sink. Light the candle in the box with a match. Take a piece of touch paper and fold it the “hot dog” way. Light the touch paper on fire with a match. Blow it out so it is smoking and glowing red. Take the smoking touch paper and place it over both of the chimneys. Pay careful attention and make observations. If you want to watch it again, follow the previous procedure (Steps 1-5). Draw and describe your observations on your lab sheet. As students move through the stations, be sure to check in with each group for understanding! Here is some classroom footage that might give you some insight into some topics you might check in with your students about. After students complete the lab stations, graphic organizers, and evaluation protocol discussions, I assign students one of models to evaluate. 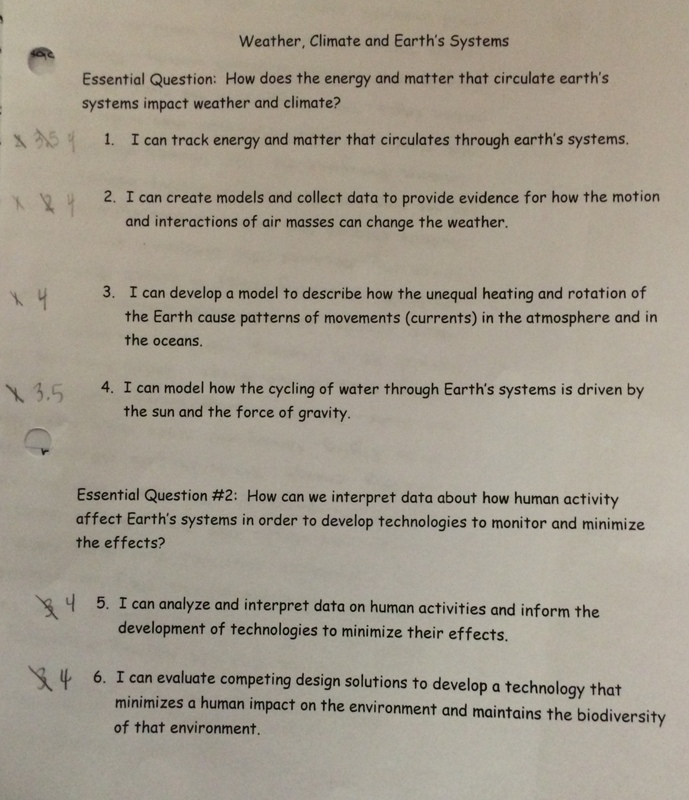 Once I assign each student either the global oceans model or global winds model to evaluate, I provide them with a tips page that can aid in organizing their thoughts. Then, I provide students with time to write their responses! Global Ocean Currents Model Student Work: In the video, I show some student work, break down the ABCDE paragraph format, and show different levels of writers' works. 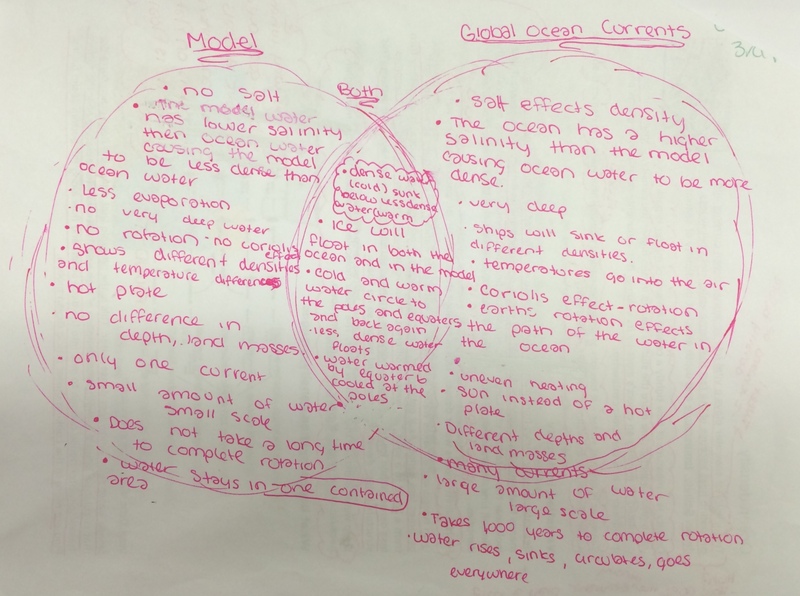 While the video only goes through some examples of responses to the global ocean currents model, I have also included example Venn diagrams and written responses of student works for the global wind responses in the resource section.